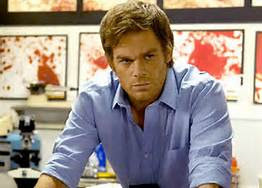 Fearless Journeys & Epic Transformations: Fangirling Dexter: Does Everyone Have a Dark Passenger? Fangirling Dexter: Does Everyone Have a Dark Passenger? I answer yes unequivocally, without hesitation, and with absolute conviction. Jung and Freud would agree, except they would call it The Shadow or the Id, respectively. The religiously inclined call it Sin. With all those names and widespread acknowledgment, my bet is the Dark Side—those socially and morally unacceptable impulses we strive to keep a lid on—is universal. What's very individual is how aware/conscious we are of those pesky little desires. Now, I'm all into depth psychology and that's pretty much what Dexter is. 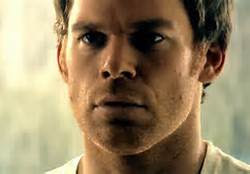 What's so wonderful about Dexter is his awareness/consciousness of his inner darkness. In fact, he's so aware that he's given it a name: The Dark Passenger. And he tells us about it in those impeccably written and delivered voiceovers: how it drives him, what it craves, and how he feeds it. What is even more fun is how he recognizes the darkness in others. As someone who is very clear about his own dark urges, Dexter's got X-ray insight into what others hide. This plays out in the series in two psychologically delightful ways. Every season, Dexter has a major nemesis. It's usually the first kill of the season, the first homicide the department has to investigate. Dexter, the unassuming lab geek, blood spatter expert in his pastel button downs and hush puppies (are those hush puppies?) is called to the scene and meets someone else's Dark Passenger via forensics. Initially, he's attracted to and/or intrigued by the clues the killer has left behind. His fascination swells as he begins his covert/unofficial/on-the-side investigation into this particular deviant. What's so cool is we, the audience, aren't just privy to the normal-homicide-investigation-analytics of your typical cop show, we get the bonus view of the Dark Passenger's analysis. Dexter is on a date with Rita. They've gone to a crab shack. "Needless to say I have some unusual habits, yet all these socially acceptable people can't wait to pick up hammers and smash their food to bits. Normal people are so hostile." Here Dexter is genius in giving us insight into ourselves. By openly sharing his Dark Passenger with the audience and its insights into other killers and normal people, the show creates a safe, creative, entertaining space for us to explore, acknowledge—perhaps, confess—become (more) conscious/aware of our own Dark Passengers. Of course in Daughter of Light, Umbra is humanity's Dark Passenger. (Can't wait to see how that's going to turn out!) I started writing the series and developing the concept of Umbra in June 2008. Dexter, Season 1, aired in 2007. Although it crossed my radar, my ego/superego completely rejected a TV series about a serial killer. When I finally broke down and watched it (see A Sympathetic Serial Killer… Right...) we rented at least the first two seasons from Netflix and marathoned them. I vividly remember the sun rising as we watched Lila's last moments in Paris. I can't remember if it was the third or fourth season we had to begin watching real time. But as I was already obsessed with depth psychology and the issues of "inner darkness," the slick genius of the show immediately hooked me. 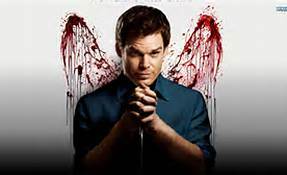 I gained even more respect for the series after reading the books, because the TV writers really balanced out Dexter's darkness with his Hero/Light/Ego side through his struggle to connect with others. Which brings us to the final season—Hannah—and Dexter's struggle to become Whole. 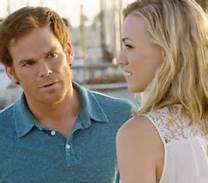 Some viewers are put out that Hannah is the final catalyst in Dexter's inner battle. They want it to be Deb. The paradox is, without Dexter and Deb, there would be/could be no Dexter and Hannah. And while enduring bonds are the stuff that makes us human, I'd argue it's true love—the romantic experience of the irreplaceable other—that catapults us into the light of our best selves. So… Will he? Will he? Will he? Three more episodes to find out what happens in this epic story about integrating dark and light. I haven't seen this show, but this post makes me want to watch it.